Mary McCullough is Interim Chair, Professor of French, and the French Program Director at Samford. She grew up in Marseilles, France, where she attended French public schools until the age of 14. She then went to high school at Black Forest Academy in Kandern, West Germany. Before coming to Samford in 2001, she taught at Michigan State University, Virginia Commonwealth University, Paris Nanterre University, and Baylor University. She enjoys teaching all levels of the French language as well as Francophone literature and film, and Cultural Perspectives. McCullough’s research interests include literature by francophone North African women, literature and film in French by the Maghrebian diaspora. She has presented conference papers at both national (SCMLA, SAMLA, MMLA, MIFLC) and international conferences (MLA, CIEF, ACTC, ALA, MESA). She has published articles on the works of Maryse Condé, Yamina Benguigui, Azouz Begag, Assia Djebar and Leila Sebbar, among others. She has also recently turned her research and teaching interests to French narratives on World War II and its aftermath, particularly focusing on domesticity and the representation of women. In the summer of 2005, McCullough was awarded a Fulbright-Hays Seminars Abroad to Egypt, where she worked on a project about women and Islam. During the fall semester of 2006, she was one of the professors-in-residence at Samford's Daniel House in London, England, where she taught a course on London’s immigrant communities. She was a Fulbright scholar in Tunisia in 2007-08, where she researched Tunisian film and taught American literature at the Institut Supérieur des Sciences Humaines in Tunis. In the summer of 2014, she received a stipend from DAAD (Deutsche Akademischer Austauschdienst) and the Goethe-Institut to study German in Dresden, Germany. In the spring of 2015, she was once again one of the professors-in-residence at the Daniel House, where she co-taught a class on London’s Monuments, focusing particularly on gender, memory and space in World War II. McCullough has been on the Faculty Senate, the Diversity Committee, the Academic Affairs Committee, and she is the Chair of Faculty Senate in 2018-19. 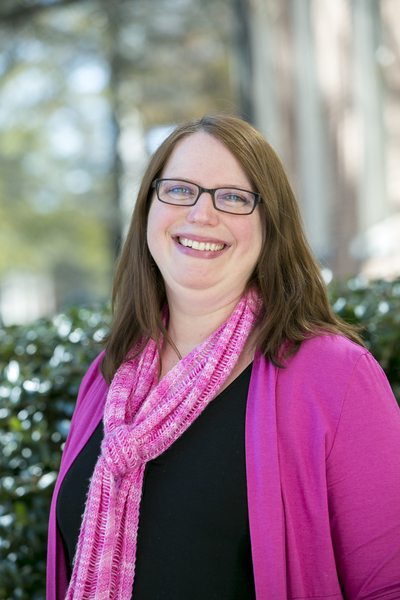 She also teaches knitting: she has led or co-led a Knitting and Crocheting for Charity Cadre for Samford students since 2012. In her spare time, McCullough enjoys traveling with her husband (who teaches junior high), going to the park with their dog, knitting, watching British mysteries, and sampling gourmet coffee and tea.